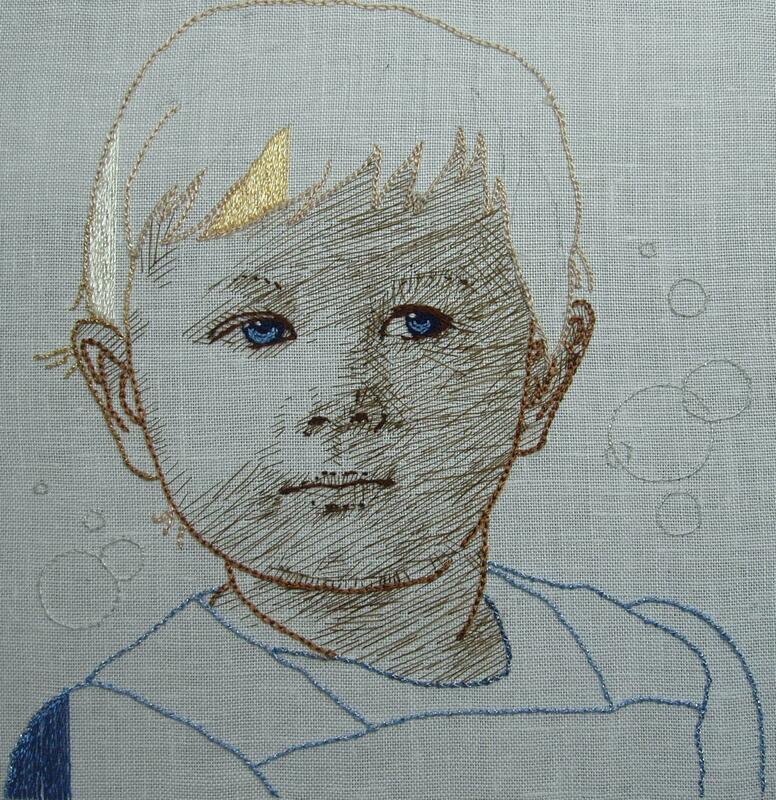 Metallics, Silk threads and DMC Rayon threads on white linen. Based on photos of Svea, the design features her blue eyes and bubbles which represents the temporal nature of life, like how fast youth and innocence disappear. I chose bold colors on the hair and clothes, using stitches referred to as “Oriental stitches” in the book “The Complete Encyclopedia of Needlework” by Therèse de Dillmont. They are called laidwork stitches in Pauline Brown´s ” The Encyclopedia of Embroidery Techniques”. Laidwork is covering an area with straight stitches, like satin stitches, and couched to hold them in place. 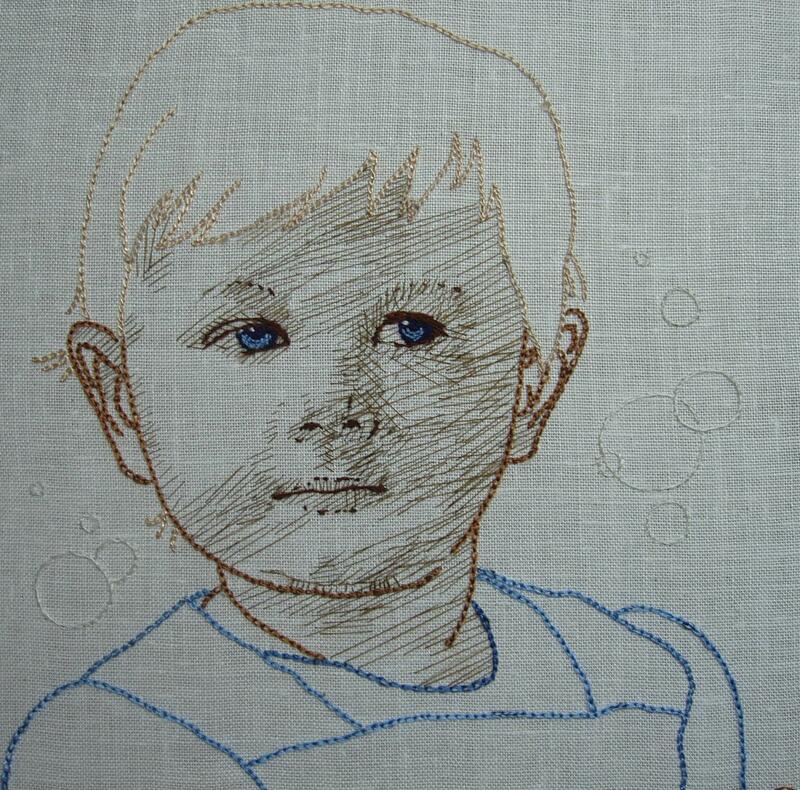 Couching can be as simple as a small stab stitch to a decorative stitches similar to filling stitches in crewel embroidery. 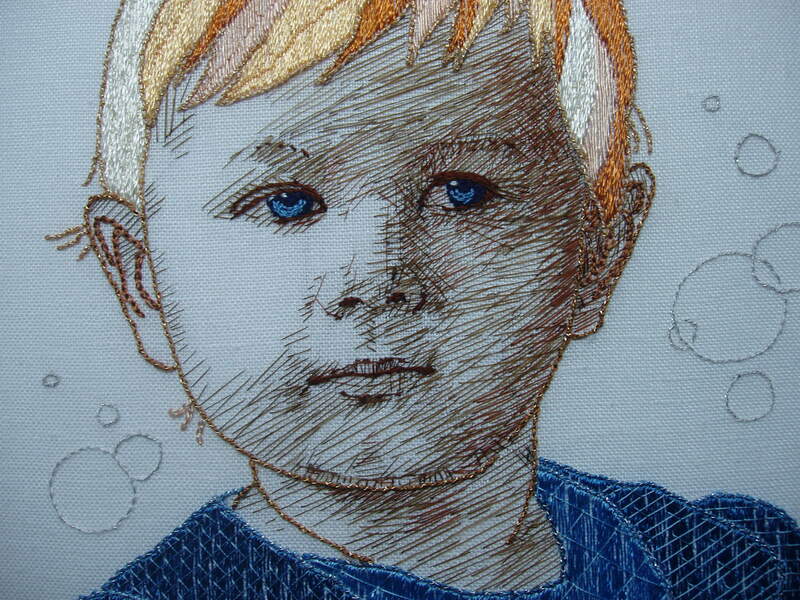 Svea´s face was stitched using thin silk thread filaments. 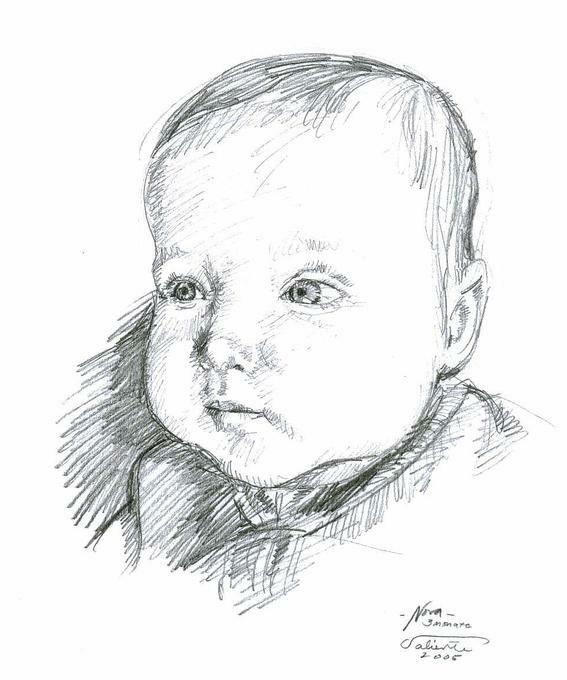 It resembles my drawing style of creating shades by using straight lines, when drawing with pencil or pen & ink. The outline cord is chain stitch using silk and whipped with metallics. Click on the photo to see the original large format. I am now starting to fill in the hair and dress with “Oriental Stitches”, usually found in antique chinese and japanese silk embroideries. The outline cord is now being whipped with metallics. If you click for the larger format, you will notice that the bubbles are also whipped with metallics. Finally finished today, it will be shipped to her grandma for customized framing. I added some more silk on the cross hatching. I struggled with the colors on the hair. Since I am colorblind, I usually trust my intuition when selecting colors. Obviously, I failed again. I could have used one color for the hair and it could have been safer that way. The blue dress end up fine. I thought if I do not start to explore colors, I will never learn to use colors at all. The linen was not fine enough to stitch my signature on like I usually do, so I just wrote it with a pen. This was also the case in Heiwa handkerchief. 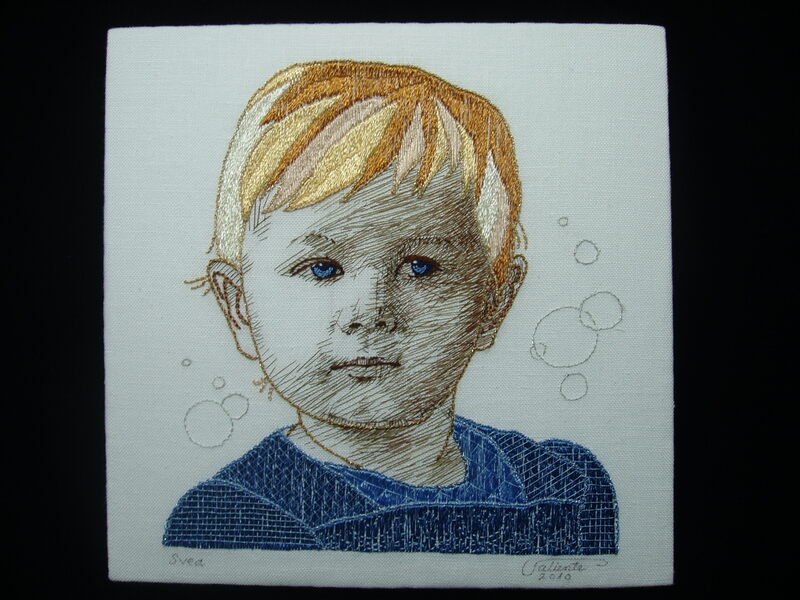 Svea was featured in craftgossip.com´s needlework gossips. Thanks to Meri and the team of craftgossip.com!